Putting ourselves in the way of beauty. Several members of the science crew joined me to witness this sunset. Before I go into the events of the research and life onboard the Shimada, let me explain the weather data I share at the beginning of posts at sea. Weather can change quickly out at sea so the ship’s Officer(s) of the Deck (OODs) keep a running record of conditions throughout the cruise. On the Shimada, the OODs all happen to be NOAA Corps Officers, but there are civilian mates and masters on other ships. Another important reason to collect weather conditions and location information is that it’s need to be linked to the data that is collected. The ship collects a lot of weather data, but I’ve chosen to share that which will give you an idea of what it’s like out here. The bridge with a view of the captain’s seat. First, I’ve shared the temperature of both the air and the water. Scientists use the Celsius temperature scale but Americans are used to thinking about temperatures using the Fahrenheit scale. On the Celsius scale, water freezes at 0°C and boils at 100°C, whereas on the Fahrenheit scale, water freezes at 32°F and boils at 212°F. I won’t go into how you convert from one scale to another, but to better understand the temperatures listed above, temperatures around 10°C are equal to about 50°F. Second, the sky conditions give you an idea of whether we are seeing blue or gray skies or I guess at night, stars or no stars. Clear skies have graced us intermittently over the past few days, but we’ve seen everything from light showers to dense fog. Third, is the wind direction and speed. Knots is a measurement used at sea. It stands for nautical miles per hour. 1 knot = 1.2 miles/hour or 10 knots = 12 mph. The NOAA Marine Weather Forecast allows us to prepare for what might be coming at future stations. Depending on wind speed, some nets cannot be deployed. If wind speeds reach 25-30 kts, the kite-like neuston will literally fly away. If a weather day ends up keeping scientists from collecting data that can be very disappointing and, unfortunately, there’s no way to make up for lost time. With the wind speeds picking up, so have the swell sizes, making for a rougher ride. As funny as it can be to watch a colleague swerve off their intended path and careen into the nearest wall, chair or person, we have to remember to, “save one hand for the ship,” meaning, be ready to steady yourself. Randy (foreground) and Larry (background) in their culinary kingdom. Considering how well taken care of I’ve been on this cruise, it only seems right to tell you guys all about the heroes of the mess (also galley, basically, it’s the dining area), Larry and Randy. 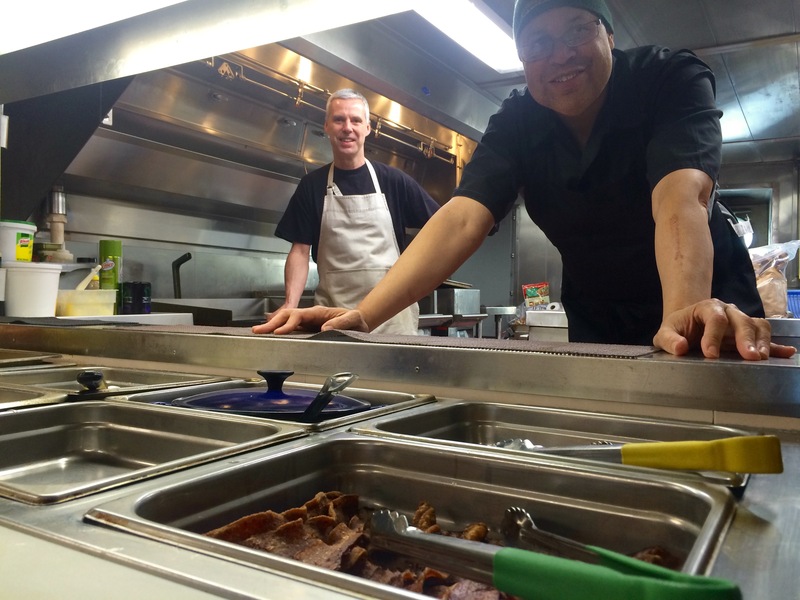 Larry and Randy plan and prepare three meals a day on board the Shimada. There’s always a hot breakfast and our dinners have included steak, mahi-mahi, and I like to think they were catering to the quarter of me that’s Irish when they made corned beef and cabbage last night. This dynamic duo really outdo themselves. Both are trained merchant mariners, meaning they hold their Z-card, and they tell me that working as a chef at sea definitely helps to bring home the bacon. It feels good knowing that they don’t want us to just have cereal and sandwiches for the two weeks we are at sea. Larry (background) and Randy (foreground) admiring their hard work. I especially want to shout out Randy, the denizen of the desserts. So far Randy has made from scratch: bread pudding, chocolate white-chocolate cookies, rum cake and date bars. Good thing for me his mother was a chef because he’s been cooking since around the age of 6. I just finished a Thanksgiving style turkey meal prepared by these two and all this told, I’m thankful there’s an exercise room on board with a stationary bike. Seriously though, these guys are doing a lot to make the ship feel like a home. With the disruption in my sleep cycle, I’ve been sleeping through some meals. Like 50% of meals. They noticed. When I came walking into dinner yesterday, after sleeping through two meals, they were full of concern and questions. Awww. So, on behalf of all the crew and scientists, I want to say thank you for all that you do! 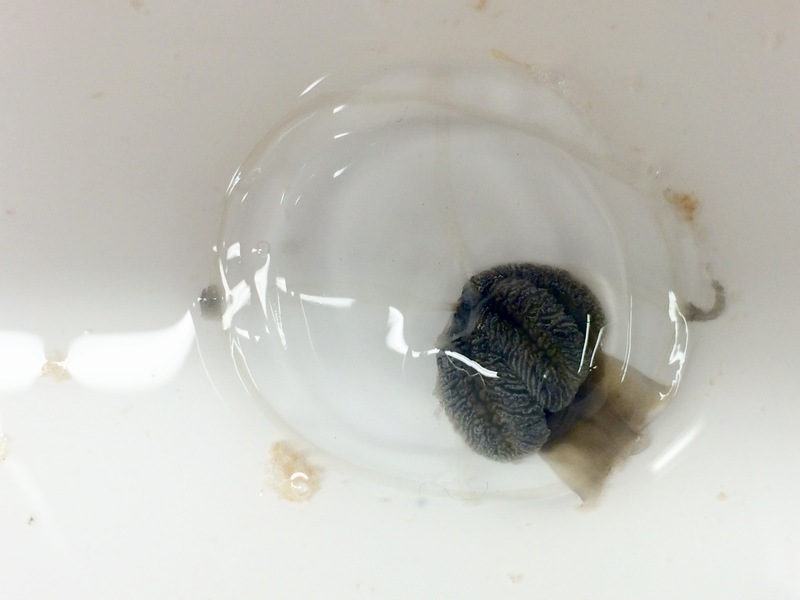 Wednesday night, or Thursday morning–days tend to run together when you’re working the night shift–the net picked up an unusual jelly that Ric had to key out using a jelly identification manual. Using photos in the Pacific Coast Pelagic Invertebrates by Wrobel and Mills, Ric identifies this jelly as the Liriope (sp. ?). While Ric is an accomplished biologist, he specializes in fish identification, so the question mark after the scientific name of this jelly represents the need for a jelly expert to confirm the identification as Liriope. But what’s in a name, right? What’s really interesting about this jelly is that it usually inhabits warm water areas between 40S and 40N. We were towing north of the 44th parallel! That wasn’t the only unusual sighting we had. Amanda, who does her surveys exclusively in the Northeast Pacific, meaning relatively close to shore (12 – 200 km) saw, for her first time in the wild, the Hawaiian petrel, a bird whose name alone suggests that Oregon is too far north to be seeing them. Additionally, it’s being more of an offshore bird makes it even more unlikely to see as far east as we are. All images in this slideshow were taken by Amanda Gladics, Faculty Research Assistant, Oregon State University. Her initial reaction to the sighting was mild surprise that she saw something she didn’t quite recognize, she decided to grab her camera and photograph the bird so she could take a second look at it. Later, she realized just how rare of a sighting she had made. After consulting with Josh Adams at USGS, it was confirmed that the bird was a Hawaiian petrel. Though most of the community nests on the big island of Hawaii, smaller colonies are found on Oahu and Kauai, and Adams explained that they tend to loop around areas of high pressure when foraging (searching) for food. It just so happens that such an area is within our transect range. If you look at the image to the right you can see this area as a loop marked with 1024 (mb, millibars, a pressure measurement) just off the coast of Oregon. Map of pressure systems and precipitation in the Pacific. 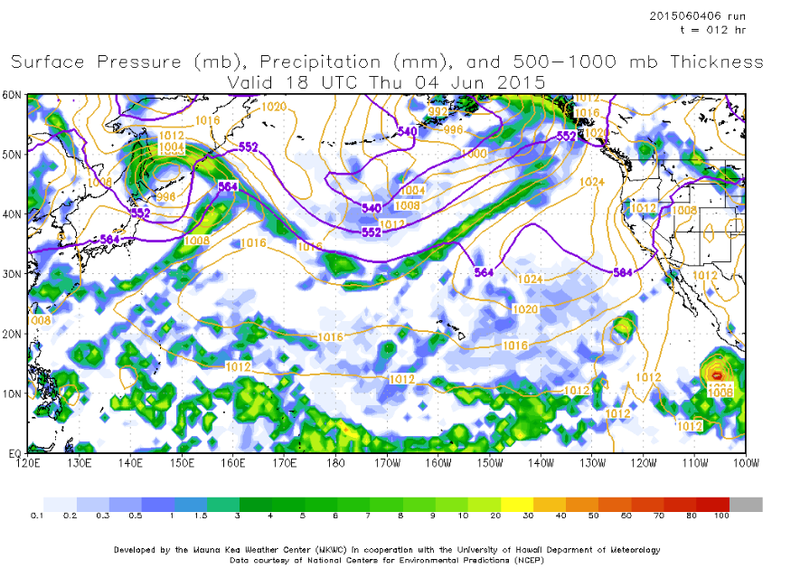 Note the high pressure system of the coast of Oregon (1024 mb). Photo courtesy of Amanda Gladics. Amanda has also sent her images to Greg Gillson and Peter Pyle, two experts in the field; Gillson confirms the sighting as a Hawaiian petrel and is notifying the Oregon Birding Association Records Committee. She is still waiting to hear back from Pyle. Considering these two events alongside some warmer water temperatures the CTD and ship sensors have picked up in our transect area, the conclusion several of the scientists are reaching is that these unusual sightings are coincident with an El Niño event this year. El Niño events occur in a cycle. They are a disruption of the normal ocean temperatures, leading to anomalously warm temperatures in the Pacific Ocean. This can affect weather and climate and perhaps it can also affect animal behavior. There’s also that warm blob to consider. You yourself can see that the water temperature is warmer here than it was at our earlier transects. For more information on how NOAA monitors El Niño events, please follow this link. In an effort to gain a deep understanding of all the research taking place on board the ship, I’ve started transitioning back to the day shift. After investing five days in training myself to stay up all night, I’m now trying to sleep through the night. My body is utterly confused about when it’s supposed to be asleep, so right now it’s settled on never being asleep. I’ve been able to catch naps here and there but I’m resorting to caffeine to keep me going. However, there’s always a silver lining. This morning I climbed to the flying bridge for a bit of solitude with the rising sun. Few things can compare to a sunrise on a ship while it’s traveling northeast and to top it all off the swells crashing against the bow were so high that, at times, I could feel the sea spray. So I thought I would make this .gif so you can share this moment too. Amanda can only survey when the ship is traveling faster than 7 kts. If the ship travels at 7 knots for 1 hour, how many nautical miles does it cover? Standard miles? This entry was posted in 2015, Alexandra Miller, NOAA, NOAA Fisheries Service, NOAA Teacher at Sea and tagged el nino, Hawaiian petrel, high winds, jellies, kitchen staff, Liriope, NOAA Careers, NOAA Marine Weather Forecast, sunrise, sunset, warm blob, weather data, weather day. Bookmark the permalink.